Think of Jamaica and certain things come to mind – one, a flourishing tourism sector, with luxury accommodation and world-class hospitality. With that, our mind wanders to azure blue seas, palm trees swaying in a light breeze, the scorching sun overhead and an abundance of colourful marine life. This scene, however, is problematic for various reasons. First, Jamaica’s tourism sector is a double-edged sword of sorts. This has to do with the primary business model it has in place, among other factors. Second, the island’s environment has been under significant pressure for some time now; this is particularly the case for the country’s marine life. Once abundant and the foundation of a thriving fisheries sector, it has been in such decline for decades that Jamaica has one of the most depleted fish stocks of any country. Sustainability is crucial for any country, but in Jamaica the matter takes on an even more urgent tone, particularly as the economy relies so heavily on its natural beauty. The story of Jamaica’s world-renowned tourism industry starts with one individual: Abraham ‘Abe’ Elias Issa. Considered the ‘father of Jamaican tourism’, in 1949, Issa opened the Tower Isle Hotel – the country’s first all-season resort. Located just outside Ocho Rio – back then, a small fishing town – the hotel swiftly rose to fame, luring Hollywood stars, sporting legends and even British royalty. Thanks to this success, in 1955, Issa was appointed president of the newly created Jamaica Tourist Board. He set forth an aggressive marketing campaign, both locally and internationally. The advertising and publicity Issa drummed up was hugely successful; under his leadership, the number of tourists arriving on the island almost tripled between 1955 and 1962. Issa made history again in 1978 when he turned Tower Isle into Jamaica’s first inclusive, couples-only resort, appropriately renaming it Couples Ocho Rios. The Couples brand – which was to spread across the Caribbean, with four hotels in Jamaica alone – was another major success for Issa, and indeed the market itself. Today, the all-inclusive business model has come to define Jamaica’s tourism sector. The all-inclusive-resort model, while extremely successful in attracting visitors to Jamaica, has an unfortunately limited impact on the local economy. With all food and drink included in a holiday package, an array of restaurants to pick from and a variety of in-house activities to sample, most tourists simply don’t venture outside of their resort throughout their entire stay. The island’s location and economic structure also limit the potential of its tourism industry. “It’s really in the nature of having a world-class tourism industry in a small island, where many other industries are not world class, that a lot of the inputs have to be imported,” King explained. Despite the scare, tourism continued to increase this year, with Jamaica recording overall market growth of 5.4 percent for the first half of 2018. This equates to 100,000 more tourists than the same period last year, with a significant 7.3 percent increase in foreign exchange earnings, reaching $1.5bn. 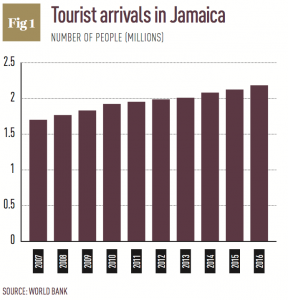 In spite of these strong figures and the upward trend in tourists visiting the country over the past decade (see Fig 1), more must be done to make tourists feel safe and want to experience the real Jamaica. If this can be achieved, local economic activity should increase and the country can really capitalise on the vast potential of the tourism industry. Naturally, changing perceptions will take time, but it should follow when crime in the country falls as a result of more effective security measures. The island’s beautiful setting is what attracts many tourists, but as more coastlines and wetlands are cleared to make way for hotel developments, the industry continues to damage its appeal. Such works are also aggravating the issues surrounding another sector. In the mid-20th century, fishing was one of Jamaica’s key economic drivers. In a bid to expand the market, during the 1950s and 1960s, the government sponsored a boat mechanisation scheme to subsidise outboard engines and fuel, while also developing training programmes for fishermen in the use of improved equipment. These initiatives increased landings by some 50 percent. By the 1960s, Jamaica’s fisheries sector was thriving, but with this came the inevitable adverse effects. According to the report Forgotten fish: Jamaica’s reef history, by 1969 grunts and large snappers were rare around shallow reefs, meaning that fishermen had to travel numerous miles to secure a profitable catch. After years of overfishing – together with other unsustainable practices, such as dynamite and longline fishing – Jamaica’s fish stocks had declined massively. Additional government subsidies in the 1970s enabled fishermen to continue their activities; however, in spite of this, their catches continued to become smaller with each passing year. The construction and subsequent presence of large-scale hotel resorts has further exacerbated the problem. Coastal developments have contributed to the country’s rapid destruction of coral reefs and mangrove forests, while also causing other negative effects, such as increased sedimentation. Poor water quality, thanks to solid waste, chemical spills, nitrification and thermal discharges, has also disturbed marine life. Add in other factors, including public disregard and physical damage from marine users, as cited in a 2017 World Bank report, and the situation has reached dire straits. Given the severity of the situation, a number of non-governmental organisations have emerged in a bid to help preserve and revitalise Jamaica’s marine life. Standing out for its success thus far is the Oracabessa Foundation, which was created in 1997 to support the sustainable development of the small coastal town that shares its name. The area is famous for being the inspiration and former home of James Bond author Ian Fleming. The organisation’s second claim to fame belongs with its founder, Chris Blackwell, the man responsible for introducing Bob Marley to the world through his label, Island Records. Blackwell is also the founder of Island Outpost, a collection of hotels and villas, which includes the Goldeneye Hotel and the Fleming Villa. In 2008, the Oracabessa Foundation teamed up with the St Mary Fishermen’s Cooperative to create the Oracabessa Bay Fish Sanctuary, a no-fishing zone that stretches along the length of the town that was legally recognised in 2010. Being a prominent hotelier in the area, and thanks also to his celebrity links, Blackwell has provided considerable assistance to Oracabessa, raising funds and awareness while also revitalising the marine area in the protected zone. But thanks to the involvement of local fishermen in particular, the sanctuary has shown impressive results: a 1,800 percent increase in fish biomass in the past seven years, along with a 150 percent increase in coral coverage. 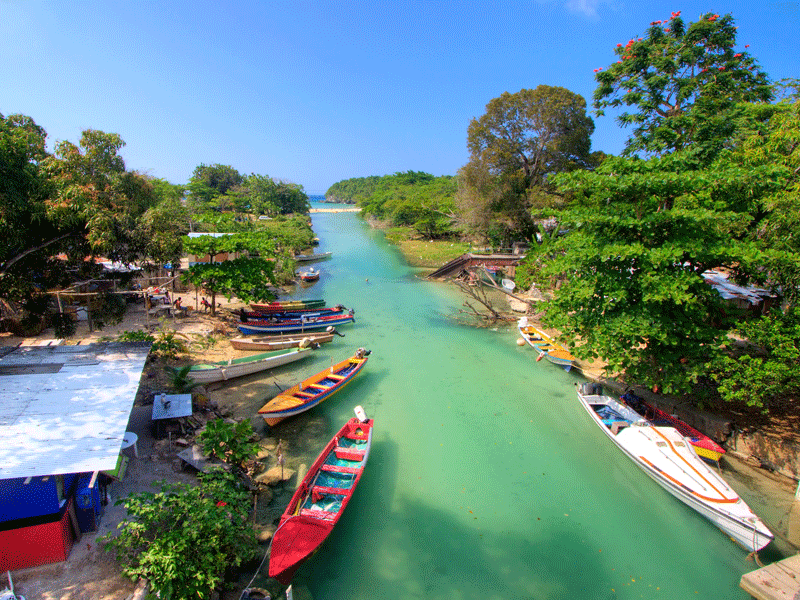 Oracabessa has inspired the fishermen of other areas to partner up with local hotels and conservationists to follow suit. Today, Jamaica has 17 Special Fishery Conservation Areas in total, and while their management and effectiveness varies, they are all showing promising results. Though seemingly separate industries, tourism and fishing are invariably linked. The two depend heavily on the environment, but Jamaica’s environment now depends on them. While the government, as well as numerous organisations and stakeholders, are all too aware of the importance of conservation to Jamaica’s economy, the demands of its development remain – and with that, continued challenges for the environment. The impending expansion of the tourism industry is a fine example of this predicament. The government’s 5x5x5 agenda involves a target of five million visitors generating $4bn by 2021, which is tied with the goal of creating 15,000 new hotel rooms and 125,000 direct jobs. But with greater volumes come greater risks to the environment. The health of coastal areas and coral reefs is imperative to the sustainability of its fisheries sector as well; this is a market that the government is also hoping to expand. Add in the dangers of climate change, which the island is especially vulnerable to, and the case for more effective sustainability practices in both fishing and tourism becomes all the more urgent for the long-term viability of Jamaica’s economy. Jamaica faces a difficult balancing act at present – that of growing its economy, and that of protecting its environment. But as the two are so closely intertwined, placing too much focus on the short-to-medium-term goals will only worsen its long-term prospects. The price to pay is far too great.